U.S. 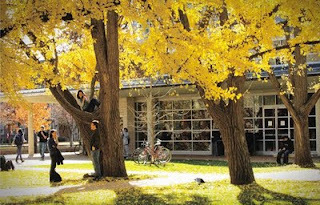 Poet Laureate Howard Nemerov, longtime faculty member of Washington University in St. Louis, loved Ginkgo trees. He wrote the Ginkgo poem "The Consent" which can be read on my website. A hand-drafted copy of the full poem hangs outside the entrance to Olin Library's Ginkgo Reading Room. The university shows its Ginkgo walk on webcam here. 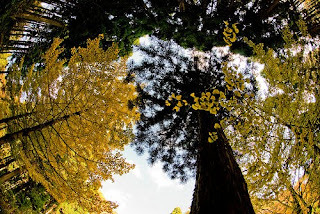 Special fisheye photo of yellow Ginkgo leaves in Japan by Abemassayuki on Flickr.com.